The Trump administration, backed by Right Wing groups and governments, does not realise that Nicolas Maduro’s government will probably not fall so easily since its pillars – millions of Chavistas – are intact and supporting their legitimate president. The world has seen how the Donald Trump administration, in collaboration with the Venezuelan oligarchy, has tried different ways and means to destabilise the democratically and constitutionally elected government in Caracas in recent years. To achieve its objective, the United States has imposed inhuman sanctions against Venezuela, exerted pressure on regional and other allies in continental and international forums to isolate the country in diplomatic and political sense, helped the Venezuelan Right Wing forces to carry out violent protests on the streets on several occasions, waged unfair media war against Nicolas Maduro’s government by bombarding one-sided narratives and fake news through big corporate media houses. The January 23 incident in Caracas needs to be seen as yet another failed attempt of civilian coup d’état to bring a regime change in this larger political scenario. The development has turned out to be an unprecedented episode in the Latin American geopolitics unleashing debates and speculations about the future of Venezuela. Wikipedia now shows Maduro as the 46th incumbent President of Venezuela having assumed office on April 19, 2013 and Juan Guaidó as interim incumbent President of Venezuela having assumed office as recently as January 23, 2019. Earlier this month, on January 10, Maduro had taken oath as the President of Venezuela in the Supreme Court as the National Assembly had turned extremely hostile for him to take the oath. The constitution of Venezuela has provision for the President-elect to take the oath in the Supreme Court in extreme cases where the oath ceremony cannot happen in the National Assembly. When Juan Guaidó took the oath as interim President of Venezuela at the Bolivar Square in Caracas on January 23, 2019, it came as a shock to many people in the world due to the confusion, chaos and speculations it created to understand the event and its consequences. After all, how could a country have a man taking oath to be the President when the actual President was still alive and active in office? However, for those who have been following the recent developments in Venezuela over the last couple of years look at it from a different perspective. Guaidó’s act may appear to be an unprecedented and shocking development but his act and its objectives should be studied in the larger context of what the Washington administration has been concocting in collaboration with the Venezuelan oligarchy and its foreign allies in the Western world for some time now. It is noteworthy to recall that Venezuela underwent Presidential elections in May 2018 in which Maduro defeated his nearest rival Henri Falcón by a big margin and won presidency for another six-year term. The elections process was criticised extensively by corporate media houses all over the world though there was no substantial condemnation raised by the national and international observers who were physically present in the country to monitor the whole election process. Though the so-called Lima Group, formed by Right Wing governments of Latin America, Caribbean and Canada in Peru in August 2017 to attack and overthrow Maduro government, took no time in extending its support and recognition of the legitimacy of Guaidó’s presidential claim, at the same time it also expressed clearly that they were not in favour of any military intervention in Venezuela. The reason is obvious. An armed conflict through military intervention will create more problems than it can resolve resulting in more Venezuelans fleeing the country and seeking refuge in the neighbouring countries of Latin America. At present, of the three million Venezuelan refugees living outside, Colombia has the highest number of around one million followed by Peru with over 500,000, Ecuador with over 220,000, Argentina with 130,000, Chile with 100,000, Panamá with 94,000 and Brazil with 85,000. Moreover, all the Latin American countries providing refuge to the Venezuelan migrants have conveyed to the international community that though they have accepted the refugees, they will need financial support to sustain them in the coming days. Interestingly, the Lima Group, led by Right Wing governments, has been attacking the Maduro administration consistently on political, ideological and economic fronts but it has not been able to accept the US proposition of military intervention. This reluctance expressed by the Lima Group has been a major hurdle in Washington’s desire to intervene militarily in Venezuela. The US interventionist approach in the internal affairs of Venezuela and other Latin American countries in the second decade of the 21st century helps the Trump administration to partially divert people’s attention from the burning issues in his homeland. By consistently bringing the world’s attention to the political and economic crisis in Venezuela, he has made efforts to tighten his grip over the Latin American region, which the US has considered its backyard for more than a century now. Twisting the arms of a neighbouring country also needs to be seen in the current global scenario where the US, under the Trump administration, has failed on several fronts like climate change, immigration, trade war and diplomatic tussles with China, Russia, and other countries, etc. India has also refused to join US in recognising Guaidó as interim President stating, “It is for the people of Venezuela to find a political solution to resolve their differences through constructive dialogue and discussion without resorting to violence”. With changes in the world order happening at a rapid rate where on several key issues in the world affairs the line drawn by the US is not always followed blindly, the US finds it easier to throw around some weight by bringing regime change in some countries in the Latin American region. It is interesting to note, however, that neither the Opposition parties now under the leadership of self-proclaimed Venezuelan interim President Guaidó nor the US administration accompanied by the Lima Group and some more Western countries attacking Maduro’s regime are still not discussing any plans to address the economic crisis. Their obsession with the regime change in Caracas shows that their fundamental objective is not to resolve the economic crisis as such but to bring the national oligarchy back in business to provide easy access to the US to the Venezuelan oil. 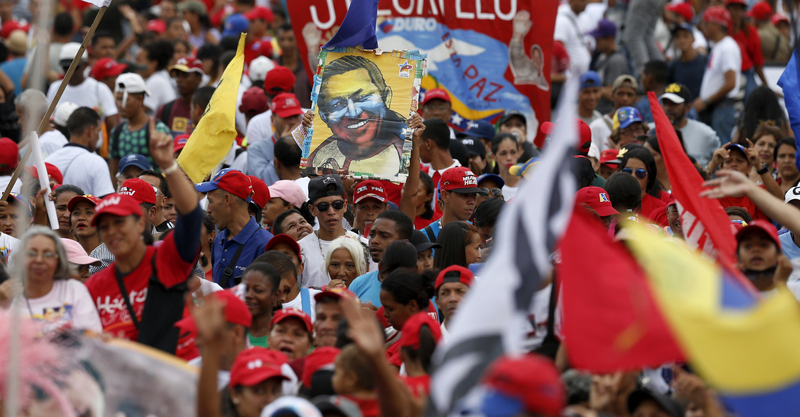 Three key issues may influence the future course of action in Venezuela. First, Guaido’s public oath ceremony as interim President on January 23 was followed by a press conference on the following day by the Defence Minister Vladimir Padrino where he announced full support and loyalty of the national armed forces towards Maduro’s government. The Defence Minister was accompanied by the leaders of the three armed forces. His press conference gained significance in the context of the shameless and constant appeals made by the Right Wing forces within the country and the US administration from outside to topple the democratically elected government of Maduro. The consistent appeals made by the Right Wing opposition of Venezuela to the armed forces to lead a coup d’état to overthrow the democratically elected Maduro’s governments have not given any favourable results except for the recent incident in Washington D.C. where a military attaché at the Embassy of Venezuela publicly declared his decision to accept the leadership of the so-called interim President Guaidó. Therefore, now there is a change in the appeal where Guaidó has asked the civilians to peacefully appeal the armed forces to change their loyalty and revolt against Maduro’s government in the coming days. The US has explicitly expressed its interest and desire to offer any kind of help or support to achieve the objective. The Right Wing forces within the country and Trump’s administration in Washington understand extremely well that if they make the armed forces change their mind and loyalty, Maduro’s government may not survive for long and in the absence of the support from the armed forces, he will practically have nothing to fight with. However, the socio-political transformation of the armed forces, a process initiated by Hugo Chávez in the early years of the 21st century, has made a military coup d’état extremely difficult to imagine in Venezuela. Carrying out military or civilian coup d’état was a practice the US resorted to very often in Latin America in the 20th century. On the other side, Maduro recently announced breaking all diplomatic and political ties with the US government, shutting down the Venezuelan Embassy in Washington and giving a 72- hour ultimatum to the US diplomats and staff in Caracas to leave Venezuela. To that the US has responded saying that they would not shut down the US Embassy in Caracas as they do not recognise Maduro as the Venezuelan President anymore. This obviously seems to be another tactical move of the Trump’s administration to provoke Maduro to react hastily and thus commit a mistake that the Washington administration can encash from. How Maduro responds to this situation may prove to be crucial in the future course of action for both sides. The UN Security Council meeting ultimately did not give any favourable results that Trump administration was expecting over the last weekend since Mike Pompeo failed to garner unanimous support of the member states against Venezuela, specially due to strong support from Russia, China, Cuba and Turkey to Venezuela. The ultimatum given by some European Union nations to the Maduro government to step down and initiate fair election process has been severely criticised by the Caracas administration claiming that it is an assault on the sovereignty and independence of the people of Venezuela. In the current scenario, Venezuela has virtually become a laboratory of imperialism where the US, drawing major support from the Lima Group, Organisation of American States and European Union, continues to experiment different ways and means to overthrow a democratically elected government but fails to realise that Maduro’s government will probably not fall so easily since its pillars – millions of Chavistas – are intact and supporting their legitimate president. The US and the Right Wing forces in Caracas need to understand that the only way to resolve the situation is through dialogue, after all, even if Maduro government finally falls today, millions of Chavistas will not disappear overnight. The sooner they understand that, the better it is for everyone. In the coming days, the decisive political outcome in Venezuela may become the defining moment in the Latin American geopolitics of the 21st century. Surendra Singh Negi, currently teaching at The English and Foreign Languages University, Hyderabad, specialises in Latin American Studies. The views are personal.